As we were getting ready to leave for our two-week trip to Virginia, I had to make sure the garden was ready to be taken care of by someone other than myself. I mulched. I sprayed the watered down milk on the squash leaves to slow down the powdery mildew. I heavily harvested the basil. I printed out detailed instructions. I gave away what we couldn’t eat. I packed six ripe tomatoes and two cucumbers into our carry on luggage. 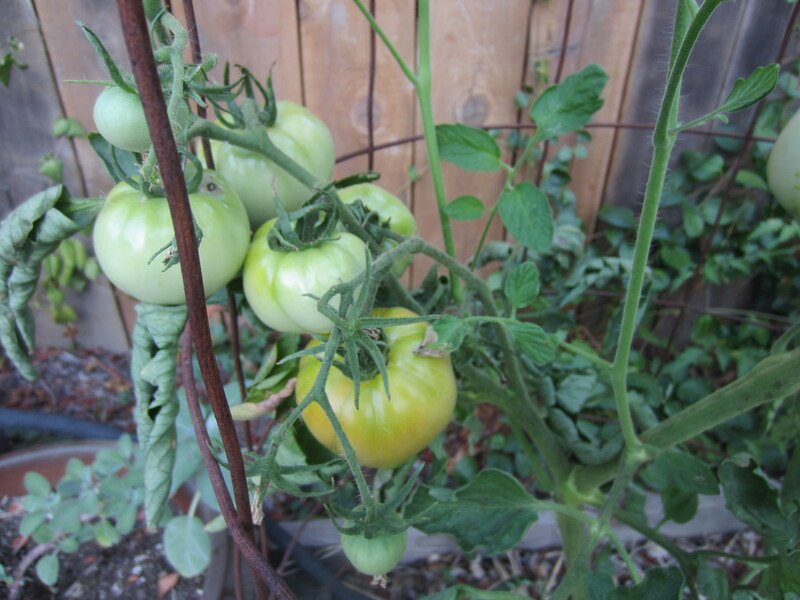 Who could part with the summer’s first ripe tomatoes? 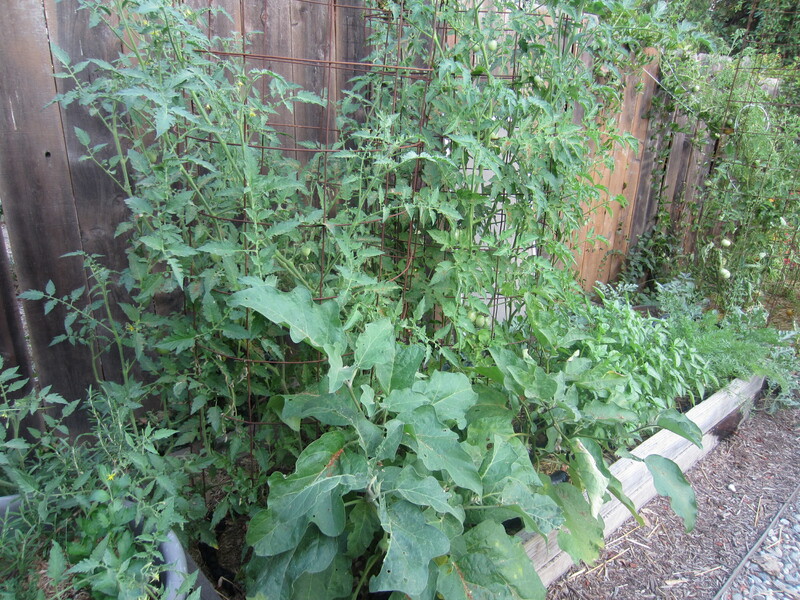 As I spent these final moments in the garden, I gazed at the nearly ripe cantaloupes, the first of the eggplants elongating, the reddening bell peppers, and the tomato plants heavy with fruit just beginning to turn red, and I thought, we have to remember to plan our trip earlier in the summer next year. It is hard to leave in the hands of another, the garden you have carefully tended to, especially at the moment it starts to produce so much produce you have the delightful problem of figuring out what to do with all of it. And so, we left and came back two weeks later…. We arrived home at night, so I couldn’t leap out into the garden to check things out the moment we walked in the door. My son, however, was up before dawn the next morning, so as soon as the sky lit up enough, I was walked outside and was relieved to see the garden thriving. And being away had its benefits too. Like, C forgot to pay our internet bill last month and we came home to find we had been disconnected from the world. When he called to straighten things out, the women on the other end tried to sell us a bundle package (cable, phone, internet). My husband declined explaining that we don’t buy cable, we really don’t watch much television, so she looked around for something else. We are now paying $15 less a month for our internet service. Maybe we should forget to pay our bill more often…. More importantly, when we came home, this was waiting for me. The next morning I harvested this and found my self with the lovely problem of having to figure out what to do with all the lovely produce. I made picadillo with fresh tomatoes and peppers from the garden. This weekend the rest of the tomatoes will be turned into salsa for eating and roasted for freezing. I traded some eggplant and a small jar of apricot jam for a dozen eggs raised just around the corner. 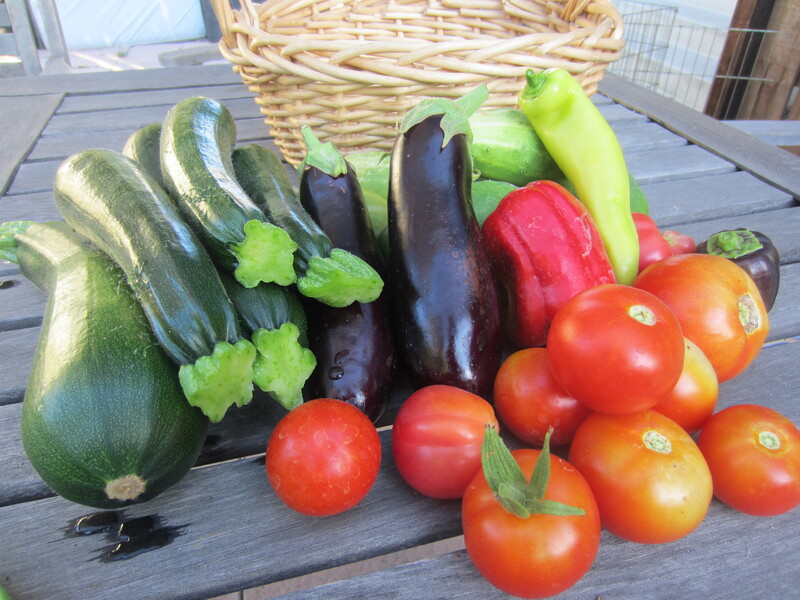 The larger zucchini will be shredded and baked into zucchini bread and taken to RIPE’s “Share Faire” in the park this Tuesday evening for our bi–monthly crop swap. Summer in the garden is good, even after you leave it in the hands of another for a couple of weeks. Thank you garden keeper. Wonderful surprise to come home to! Yes, indeed! I hate leaving the garden, but it was nice to come home to so much produce! 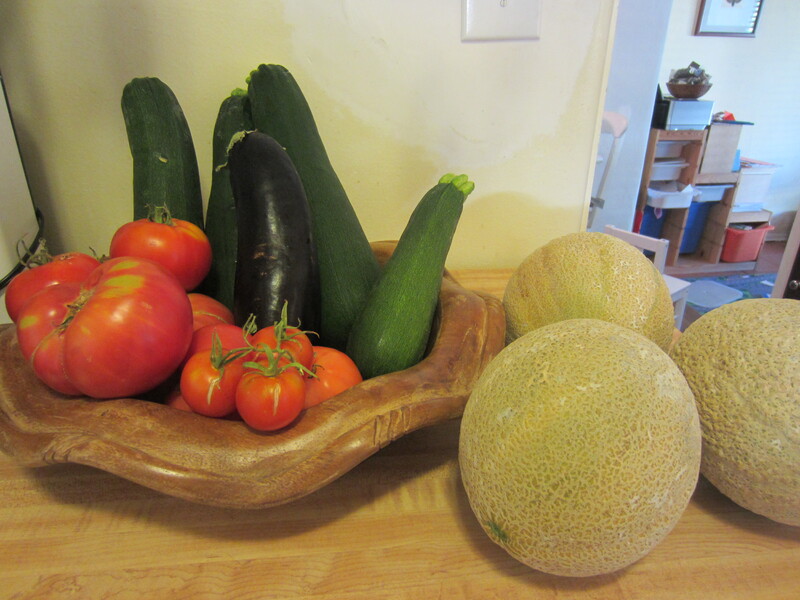 What a wonderful harvest to come home to – and those melons, I can alost smell their sweetness from here ! I think the melons tasted even sweeter knowing they were grown in the backyard. I’m jealous of those melons! … sounds like a blooper… but I mean it 🙂 We can’t really get those in the pacific northwest. I imagine it would be tough with such a short, coolish summer. On the flip side, the PNW is one of the most beautiful places in the country, in my opinion :). Oops, thought you were referring to the PNW in the USA. I have never been to Germany…. Oh, now it all makes sense! I was thinking, how does Germany have an area called the “Pacific Northwest”? beautiful fruits of your labor!